The revived anti-nuclear movement has promise, for the people coming together to volunteer and take on tasks are experienced. Those who are not veterans of the 1980s protests are dedicated and energetic. They're all ready for a fight to the finish: victory over allowing more Fukushimas, Chernobyls and Three Mile Islands. The senator, whose district includes the site of the nuclear plant, assailed the federal agency for what he called its decision to look at Diablo Canyon seismic issues "through rose-colored glasses" despite the damage to nuclear reactors in Japan resulting from last month's earthquake and tsunami. 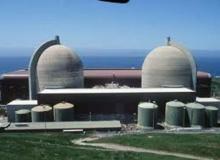 A major demonstration seems to be taking shape on Saturday, April 16 near San Luis Obispo which is near the seaside Diablo Canyon nuke. For details click here. 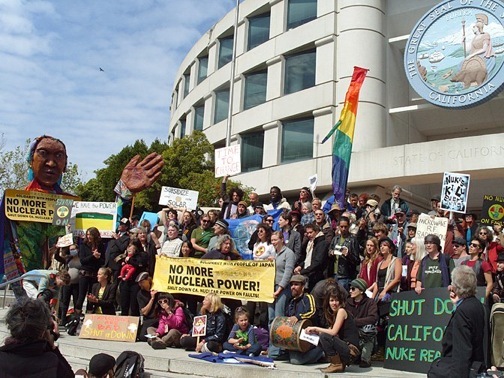 Three dozen anti-nuclear activists spoke passionately before the California Public Utilities Commission against the further operation of state nuke plants, on Thursday morning in San Francisco before the rally. Earthquake faults, lack of evacuation feasibility, and disregard for future generations were among the objections. No one at the public hearing spoke in favor of nuclear power, although several speakers overlapped with another contingent of activists: anti-Smart Meter consumers justifiably worried over wifi radiation, invasion of privacy, and unfair cost. I'm Jan Lundberg, formerly of Lundberg Survey, now with Culture Change. I served on San Francisco's Peak Oil Preparedness Task Force. In my prior service to Big Oil, government agencies, and then in the nonprofit sector, I found that the big assumption is that we need a vast overabundance of energy. Where do we stand? Big energy in the form of the BP-Macondo disaster and Fukushima indicate a system out of control. The industrial mindset says it's okay to mess with life on Earth - but it's not okay, and we're barely starting to pay the price. Keeping the lid on the truth about nuclear power will be about as successful as it was keeping the lids on those nuclear reactors that exploded at Fukushima. Following is a link for viewing good TV coverage of the hearing and the rally, by the ABC affiliate in San Francisco. It gives an overall picture of the main issues, along with more input from the public. You can see me in line to speak at the podium, the tall fellow wearing a dark blue suit. Watch now. Only an insane anarchist or a full blown psychopath would advocate nuclear energy. Nuclear technology is inherently EVIL, an evil that even Satan would not do. Those who advocate for nuclear power worship disease and horrible DEATH. The are insane. They are EVIL.